Advent, a penitential season in Catholic and Orthodox Christian churches, begins four weeks before Christmas. During Advent, the faithful Catholic pray, give alms, fast and perform acts of sacrifice. It's a lesser Lent. 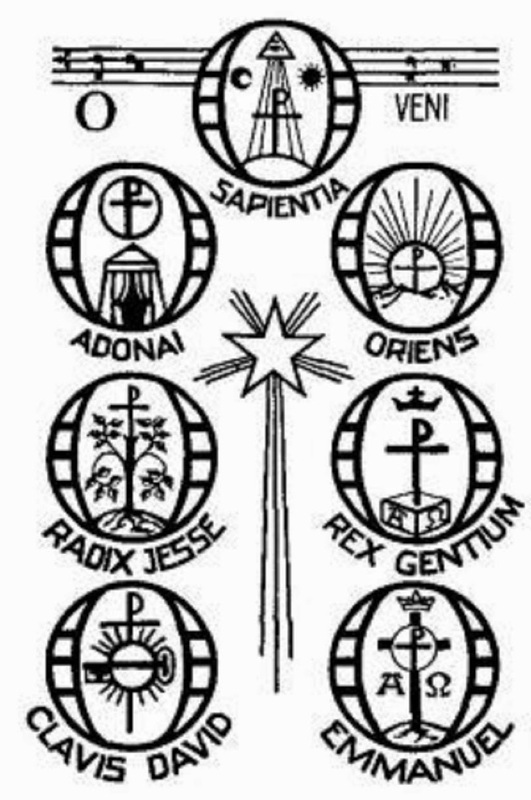 Starting Dec. 17, in Advent, says Benet Vision, the Catholic church counts down the last week till the Octave of Christmas, praying the Magnificat or O Antiphons (names for Jesus) litany. The Magnificat was the Blessed Virgin Mary's prayer to God. Each day focuses on a different Biblical name for Jesus. These ancient messianic titles are referenced in the Old Testament of the Bible. They can be found in the hymn "O Come, O Come Emmanuel." Here are the titles in Latin and English. The Advent tradition of praying the Magnificat O Antiphons began in medieval times. Some protestant churches pray them too. Here are free printable Magnificat O Antiphons coloring sheetsto help children learn and pray these sacred worshipful devotions. Family Feast and Feria has freeprintable ancient Catholic church images found in stained glass windows to color. Have children, make them into a prayer booklet. Teach kids that the first title letters, Emmanuel, Radix, Oriens, Clavis, Rex, Adonai and Sapienta spell the Latin word "erocras" meaning "Tomorrow, I will come." Advent anticipates the coming of Christ at Christmas. The O Antiphons take us to Dec. 24 the Feast of Christ's mass (Christmas). The symbol for Jesus is two Greek letters Chi Ro (X and P). It looks like a Pax sign. You might also have children create free printable Jesse Tree ornaments and decorations for the Christmas tree. Children could learn to play O Come Emmanuel. Here is free printable sheet music for different instruments. Perhaps they could learn to sing it and share at a nursing home or church senior group. Words are included on the links. You might also make treats based on the seven Catholic Magnificat O Antiphons. Cut sugar cookies shaped printable images. Or cut them like a star, sun, tree, key, King's crown, Bible, cross, Chi Ro, fish, baby. Help kids explore the O Antiphons with all their senses.